Tip: Having trouble connecting to Tor? You may need to use a different pluggable transport. Click here for more information. Bridge relays (or "bridges" for short) are Tor relays that aren't listed in the main Tor directory. Since there is no complete public list of them, even if your ISP is filtering connections to all the known Tor relays, they probably won't be able to block all the bridges. If you suspect your access to the Tor network is being blocked, you may want to use bridges. The addition of bridges to Tor is a step forward in the blocking resistance race. It is perfectly possible that even if your ISP filters the Internet, you do not require a bridge to use Tor. So you should try to use Tor without bridges first, since it might work. Note that it's also possible that Tor is non-functional for other reasons. 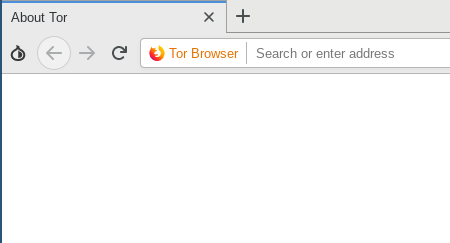 The latest version of Tor Browser tries to give you better hints about why Tor is having problems connecting. You should also read the FAQ about problems with running Tor properly when you have issues. If you feel that the issue is clearly related to Tor being blocked, or you'd simply like to try because you're unsure or feeling adventurous, please read on. Ensure that you're using the latest Tor Browser for your platform. To use a bridge, you have two options. Tor Browser now provides some bridges by default. You can enable these easily. Unfortunately, because these bridges are publically distributed, it is easy for censors to block some of them, so some of them may not work. In this case, you'll need to locate different bridges. Furthermore, you'll need to configure Tor Browser with whichever bridge address you intend to use. If your Internet connection requires the use of a proxy, you'll probably need to configure Tor Browser to use it first. If you don't think you need to configure a proxy for your Internet connection, you probably don't. Give it a try and if you have issues, ask us for help. Over the last few years, censors have found ways to block Tor even when clients are using bridges. They usually do this by installing special boxes at ISPs that peek into network traffic and detect Tor; when Tor is detected they block the traffic flow. To circumvent such sophisticated censorship Tor introduced pluggable transports. These transports manipulate all Tor traffic between the client and its first hop such that it is not identifiable as a Tor connection. If the censor can't decide if the connection is a Tor connection, then they are less likely to block it. Sadly, pluggable transports are not immune to detection, if a censor is given enough time. In the past, we promoted obfs and obfs2 as safe transports. These are now deprecated and were replaced by obfs3, scramblesuit, fte, and obfs4. Bridges which support pluggable transports can be used with Tor Browser easily. Tor Browser includes some pre-configured bridges and you can get more from BridgeDB, if those don't work. Understanding the components of a bridge line isn't strictly required but may prove useful. You can skip this section if you'd like. The first element is the name of the pluggable transport technology used by the bridge. For example, in the case above, the bridge is using the obfs4 pluggable transport. First, you should read the FAQ about problems with running Tor properly when you have issues. Sometimes Tor does not work due to a silly mistake rather than your ISP interfering with your Internet connection. 1) To add a bridge, follow the instructions on screen. Click the "Configure" button. 2) Proxy and Censorship prevention settings are now on one page. If your Internet Service Provider (ISP) blocks or otherwise censors connections to the Tor Network, tick this checkbox. 3) If you must configure a proxy then, activate the second checkbox and enter the details. 4) Now you have three configuration options. You can use bridges which are preconfigured and provided with Tor Browser, you can specify your own bridge(s), or request bridges. 5a) If you want to use one of the provided bridges, then choose one of the offered transport types. obfs4 is currently recommend, but depending on where you are located another one may work better for you. If you have any questions, please contact us. 5c) To use a custom bridge select "Provide a bridge I know". 6) After you decide which bridges you want to use, click "Connect". Tor should now be able to load successfully and the browser window should appear. Sometimes the bootstrapping gets stuck at some point, for example when a bridge went offline, the connection is blocked, or when the Pluggable Transport is hit by a bug. Ideally it works after some tries, using a different bridge, or restarting the browser. If not, remove the Tor Browser folder and extract the archive again. It should work now. If it still fails, we want to hear from you! The following instructions assume Tor Browser successfully loads and you are able to surf the web. If you do not see the web browser when you run Tor Browser (like in step (1) below), you may need to follow the instructions above. 4) Now you have three configuration options. You can use bridges which are preconfigured and provided with Tor Browser, you can request new bridges, or specify your own bridge(s). 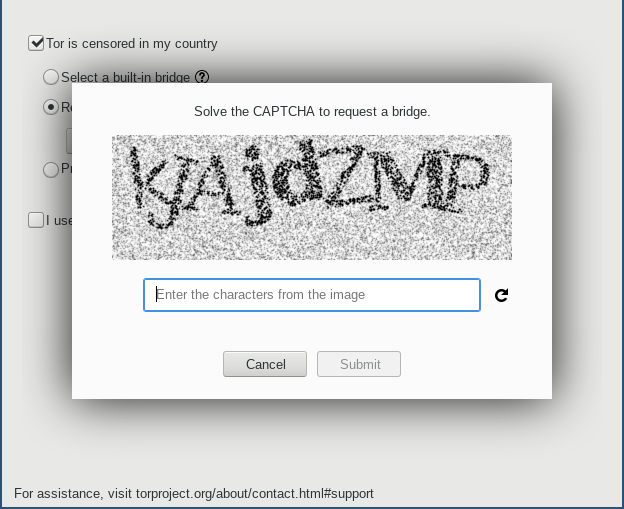 5b) If none of the provided bridges works for you, try "Request a bridge from torproject.org"
If you need to get bridges, you can get a bridge by visiting https://bridges.torproject.org/ with your web browser. Once you've received the email with bridge information, you can continue the configuration steps outlined above. When configured as a bridge, your server will not appear in the public Tor network. Your bridge relay will automatically publish its address to the bridge authority, which will give it out via https or email as above. You can construct the bridge address using the format above (you can find the fingerprint in your Tor log files or in /var/lib/tor/fingerprint depending on your platform). If you would like to learn more about our bridge design from a technical standpoint, please read the Tor bridges specification. If you're interested in running an unpublished bridge or other non-standard uses, please do read the specification.